Sometimes, The Best You Can Do Is Just Get Out Of The Way. I love this headline so much. I was about halfway through writing a mildly funny thing of Romney accusing the media of maligning him in the fashion of an article just maligning him to pieces (“‘You keep misrepresenting me!’ Romney whined, scraping a bit of something – possibly dried vomit or, who knows, heroin – from his tie…”), when I had to stop. The headline says it all, doesn’t it? You can see – you can just see – the journalist smiling at you from behind that headline. All media is biased, of course it is – it’s constructed by humans who choose what to say and how to say it. Often, we attempt to remain neutral… often we fail. (or worse, reduce everything to having 2 sides. How many complex problems do you know of that have only 2 sides?) And so sometimes it’s kind of nice to have the media just throw it out there. Who knows, maybe they’re feeling extra kicky after the opening ceremonies of the Olympics and the release of the new Bond film trailer. Whatever the reason, this headline just makes me laugh and laugh and laugh. And I can’t top it. So… I’ll just get out of the way. I’m finding it harder and harder to tell which headlines are real and which are from The Onion. AAAAAAUGH!!!! WHY DIDN’T I THINK OF CALLING IT THAT??? WHY? WHY? WHY? WHY? AAAAAAAUUUGH!!!! Maaaybe if someone ran all of his posts by his BFF first we wouldn’t be in this predicament. She’s your editor now. Every post will have a chipmunk picture posted somewhere. Wait a minute. There are more than two sides to things? Different shades of gray? Different shades of grey? Actually, the way the news has this habit of pretending that there are two equalsides irritates me too. They stretch the equality issue way beyond actual fact more often than not. But with Mitt you only have to show him saying two different sides of the same argument. The most recent is (1) insulting both Israeli’s and Palestinians with the “they have lots of money because of their culture” comment; (2) saying he didn’t mean that, then (3) with right wing pressure, saying, “um, yea, I did..
Yeah, he lost the Jewish vote on that one. He still has Sheldon Adelson’s vote and his $100 million. It’s not easy to offend both sides in one statement. You have to give him kudos for that. Let’s see mister fancy pants Obama offend offend Israel and Palestine at the same time. But then he went and changed his mind to pander to the right wing folks who said that it is true that Jews are good with money (or they said something like that). Now he’s saying he was right to begin with. The only folks he hasn’t offended are the ones that aren’t listening. What a twit. Satirists around the world have been doing it tough for a number years now but finally George Bush has a truly worthy successor. Palin was it for a while, but she – as awful as she was – lacks that certain “I’ve lived such a life of pampering and wealth that I have no idea what reality even is” buffoonery that makes satirizing politicians so fun. 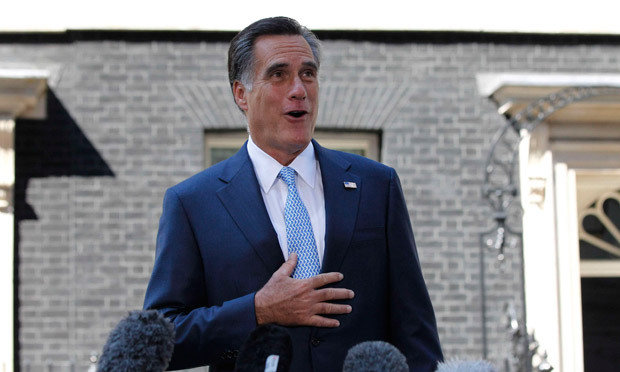 OMG, Mitt is so easy that I am actually having trouble writing stuff that NOT about him! I have not had a blog at the time of GWB was president, so I can’t really compare, but it’d think it’s pretty much a tie. And if Romney ever picks Palin as a VP… That Satirist’s Dream Team will beat Bush/Cheney every time. I thought the campaign season of 2008 was fun, full of sound bites and idiots. Or, was that idiotic soundbites? But this, oh this season is worse. Or is that better? All Mitt has to do to really send it to the moon, well pick Bachmann, what a perfect ticket that would be you know Mitt the Twit and Michelle from Hell. Let’s not discount Biden – he’s always good for a laugh. And a keg stand, probably, but definitely a laugh. Not just typing it, but actually, in real, true stereo sound LAUGHING OUT LOUD at that reply! I’m annoyed that you will point out teh errers in this commant becuz their ain’t any so it’s not truthy. Stops doings thats. I stick to the Onion, eventually everything they write becomes a reality and I get to laugh twice. The thought of a Brooks Brothers mannequin talking scares the crap out of me, so I try to avoid Mitt’s live speeches. I love American politics, so much more hokey and entertaining than ours. I think I”d love it for that same reason if I didn’t live here. Hehehe. Sometimes you really do have to give the media props for being awesome, even if you’re the hater type. (Not that you are.) I’ve been playing with the idea of writing a post about Mr. Romney’s trip, but I just keep concluding that it’s really best to let him speak for himself. I do wonder when I get to look down my nose at him from my monicle and say, “You, suh, are a jahkahss.” I guess that’s the first Tuesday in November (not that the Obama administration has been able to get out of ITS own way lately, either). That is a freaking great headline. I am surprised the writer got away with it in a way. Whoever their editor is obviously has a sense of humor. Disagreeing and maligning are the same thing, right? How many complex problems do you know of that have only 2 sides? Oh, how I wish more people would (more frequently, in some cases) ask themselves this question! Too true about reports in The Onion becoming reality! This morn, there was a headline of some new extraordinarily lame scandal out there (can’t even remember what), a scathing report of how Karl Lagerfeld doesn’t like Pippa Middleton’s face (cripe, is there some other Pippa with whom we could confuse her?? ), and it’s been determined now –such a close call, I didn’t dare read further than the blurb– that it was NOT mom’s fault that her kayaker son did not advance. Is it fair to say the more journalists die, the more no one replaces them? I love it SO MUCH also. Wasn’t that how they used to sell news? Er, headline writer…my iPad makes me stupid. He should have gone down well in the UK really. All our politicians are inept people with bad communications skills.As for the UK media?They’re just a pack of jackals,like anywhere else.